After two weeks of waiting I finally have the Desire in my hands. Before looking a bit more at the Desire, lets finish off the problems I had with delivery. 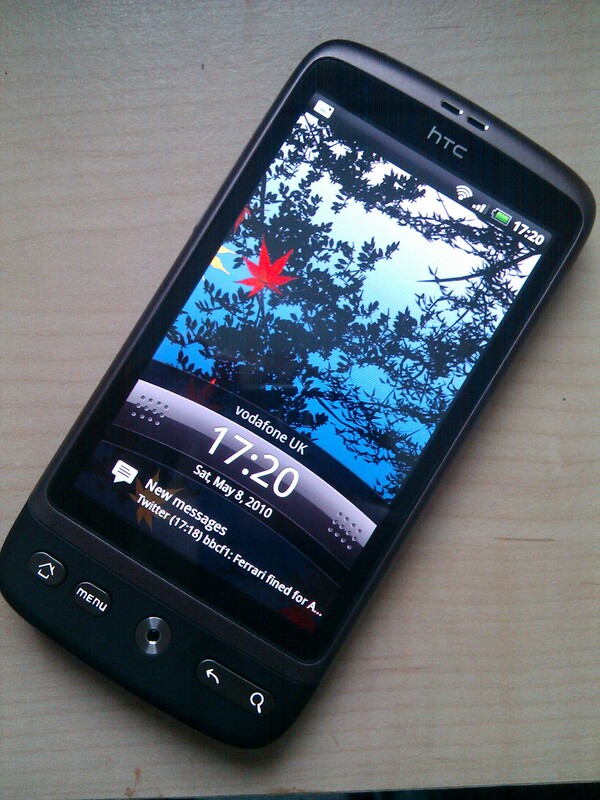 Two weeks after ordering, I finally had the HTC Desire in my hands. Vodafone’s customer service was appalling. At no point in that time did they contact me to say it was out of stock and I would have to wait. Even when I sent an email to the email address I was told, they failed to reply. The only reason I knew I was waiting was because I went on their eForum – a customer should not have to do this. Because of reading this eForum, I knew I’d missed out on one stock delivery they got in. I also knew when they got the second (so when to expect notification that my phone had been despatched). However, they failed to send me an email to tell me the phone had been despatched, the first I knew about it was when I got an email from the Vodafone Store I was collecting from, telling me it was ready for collection. I also knew through this eForum that they were sending out 16GB SD Micro Cards to people affected by the delay. However, when I opened up the phone, there was no sign of the card or any notice of it. I had to email them again to chase this up and a few days later, I got a reply informing me that the card was out of stock (oh the irony!) and they didn’t know when they’ll be despatching in, however, I would be receiving one. I’m a bit more sceptical and I’m wondering if they’re making people contact them before sending them out, to reduce how many they’ll have to send out. There was only one other minor problem, which worked in my favour – my order hadn’t picked up my PAC code to transfer my number from Orange to Vodafone. One phone call sorted this out (the one guy actually phoned me back as he had to go and get more information which was taking a while – this impressed me) and two days later (yesterday at time of writing), my number was transferred over and I was able to use my new phone. Quite pleased this mess up happened though as it meant my number wasn’t transferred whilst I was still waiting for a phone! Now I’ve only been using the HTC Desire for about 24 hours, so this look at it is very brief. I have, however, had a Nexus One as my work phone for the last few months, so already had a home screen layout I liked and knew what applications I had to get on there straight away. The phone itself is nice to hold and I much prefer the physical buttons on it rather than the touch on the Nexus One. I haven’t used it much, but I am not like the optical replacement to the trackball, it just doesn’t seem as sensitive. I won’t comment on the battery life yet – it is poor at the moment (didn’t do a day, though I was playing on it a lot more than normal), but hopefully it will improve. I’m a bit disappointed that the Desire didn’t come with a neoprene case like the Nexus One did. I like the one on my Nexus One so much that I have actually gone out and ordered one for it. The main difference between the Desire and the Nexus One is the introduction of HTC Sense. This hasn’t made much difference to me – I removed a lot of their widgets, though I do think generally it makes Android look nicer. One of the differences I have noticed though is with the keyboard, which is slightly different to that on the Nexus One. I’m hoping I’ll get used to it quite quickly and will start preferring it, but at the moment, I do prefer the one on the Nexus One. I haven’t got many exciting applications on yet – I use Seesmic for Twitter, got Foursquare installed, Remember The Milk (a must have for me), a collection of games I liked playing and also ShopSavvy – can’t go shopping without it. The other thing I had to do was configure some of my personal email accounts, which for the non-Google ones was a small nightmare – expect another blog post about this soon! The other good thing about having my own Android device now is that I can do some app development. Hopefully, once I’ve got my development blogging there will be some posts on that. As I use it more, there might be some more posts on the blog about the applications I really like using, but for now I can certainly say that it’s a lot better than my Nokia N70 (which is now somewhere in the Royal Mail System on its way to be swapped for some cash!). Have you played with HTC Desire, or are thinking of getting one? Perhaps you’ve got an Android Device and have some applications you recommend. If so, leave a comment below. Note: I am currently on an internship at Vodafone. These thoughts are completely my own after purchasing a phone as a normal customer and do not reflect those of my employer. photos, to industrial purpose, the uses are unlimited. current MH and HP grow lights. the trackpad for brand new users seems a bit smaller. Whatever the reason, the new generation notebooks are better, cheaper plus much more appealing than the previous ones.